The Tamu Massif is an extinct submarine shield volcano in the northwest Pacific Ocean. That it could be a single volcano, was announced on 5 September 2013; if corroborated, this would make Tamu Massif the largest known volcano on Earth. It is in the Shatsky Rise about 1,600 km (990 mi) east of Japan. Its summit is about 1,980 m (6,500 ft) below the surface of the ocean, and its base extends to about 6.4 km (4.0 mi) deep. The volcano is about 4,460 metres (14,620 ft) tall. William Sager, a marine geophysicist from the Department of Earth and Atmospheric Sciences at the University of Houston, began studying the volcano in about 1993 at the Texas A&M College of Geosciences. According to Sager and his team, Tamu Massif is "the biggest single shield volcano ever discovered on Earth". Other igneous features on the planet are larger, such as the Ontong Java Plateau, but it has not yet been determined if they are indeed just one volcano or rather complexes of several volcanoes. The Tamu Massif was formed about 145 million years ago during the Late Jurassic to Early Cretaceous period over a relatively short period of time (a few million years) and then became extinct. If confirmed, the suggestion that it could be a single volcano would make the Tamu Massif the largest known volcano on Earth, dwarfing the current record-holder, Mauna Loa on the Hawaiian Islands. Tamu's rounded dome extends over an area of 450 km × 650 km (280 mi × 400 mi), totaling more than 292,500 km2 (112,900 sq mi), many times larger than Mauna Loa, which has an area of 5,000 km2 (1,900 sq mi), and about half the area of the Martian volcano Olympus Mons. [a] The entire mass of Tamu consists of basalt. Its slopes are very gradual, ranging from less than half a degree to one degree near its summit. 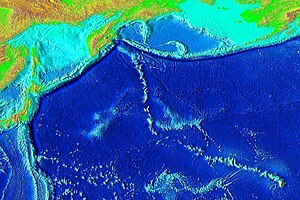 The Shatsky Rise oceanic plateau is comparable in size to California or Japan, but Tamu Massif, which is the plateau's oldest and largest edifice, is comparable in size to New Mexico or Britain and Ireland together. 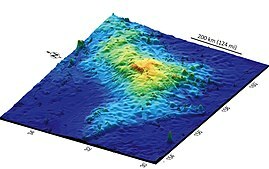 Using magnetic lineations, researchers discovered that there are three bathymetric highs and a low ridge, a topography that would imply three separate volcanoes; but the plume-head model indicates a single massive volcano. Based on multichannel seismic profiles and rock samples from Integrated Ocean Drilling Program (IODP) core sites, Tamu Massif appears to be a single massive volcano made of lava flows that emanated from the volcano centre and formed its shield shape; however, the profiles have large gaps in them, leaving open the possibility that it may represent the activity of more than one volcano. The name Tamu is taken from the initials of Texas A&M University, where William Sager, a geology professor at the University of Houston and one of the lead scientists studying the volcano, previously taught. Massif, which means "massive" in French, is a large mountain or a section of the planet's crust that is demarcated by faults and flexures. ^ However, other Martian volcanoes, Alba Mons and Syrtis Major, have areas more than twice that of Olympus Mons. ^ a b c d e f g h Dennis Bryant (2013-09-05). "Possibly the largest single volcano on Earth". Maritime Magazine. Retrieved 2013-10-04. ^ Mahoney, J. J.; Duncan, R. A.; Tejada, M. L. G.; Sager, W. W.; Bralower, T. J. (2005). "Jurassic-Cretaceous boundary age and mid-ocean-ridge–type mantle source for Shatsky Rise". Geology. 33 (3): 185. doi:10.1130/G21378.1. ^ Witze, Alexandra (2013-09-05). "Underwater volcano is Earth's biggest". Nature News & Comment. doi:10.1038/nature.2013.13680. ^ a b Myslewski, Rik (2013-09-05). "The Solar System's second-largest volcano found hiding on Earth". theregister.co.uk. Retrieved 2013-09-07. ^ "Bottomfish fisheries by Japan, Russia, and Republic of Korea occur on various seamounts in the northwest Pacific within international waters". pifsc.noaa.gov. Honolulu, HI: Pacific Islands Fisheries Science Center, NOAA. Retrieved 2013-09-07. ^ "Scientists Confirm Existence of Largest Single Volcano On Earth". ScienceDaily. 2013-09-05. Retrieved 2013-09-07. ^ a b c Sager, William W.; Zhang, Jinchang; Korenaga, Jun; Sano, Takashi; Koppers, Anthony A. P.; Widdowson, Mike; Mahoney, John J. (2013-09-06). "An immense shield volcano within the Shatsky Rise oceanic plateau, northwest Pacific Ocean". Nature Geoscience. doi:10.1038/ngeo1934. ^ Plescia, J. B. (2004). "Morphometric properties of Martian volcanoes". Journal of Geophysical Research. 109 (E3). doi:10.1029/2002JE002031. ^ Kim, Meeri (2013-09-06). "New Mexico-size volcano discovered in the depths of the Pacific Ocean". Washington Post. Retrieved 2013-09-10. ^ Sager, William. "Tectonic Evolution of Shatsky Rise: A Plateau Formed by a Plume Head or Not?". MantlePlumes.org. Retrieved 2013-09-07. ^ "World's Largest Volcano Now Named TAMU". Tamu Times. Texas A&M University. 2013-09-05. Archived from the original on 2013-09-08. Retrieved 2013-09-07. This page was last edited on 20 April 2019, at 10:13 (UTC).